Participants in Milwaukee Area Time Exchange earn credits for hours worked and can redeem them for services provided by others. 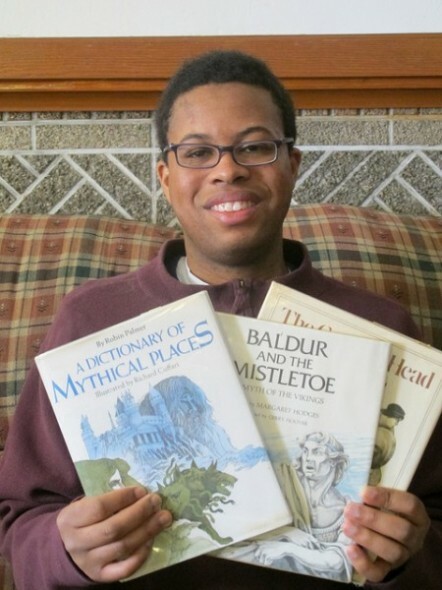 Yahyal Siddiqu, 23, a resident of the Midtown neighborhood who was diagnosed with Asperger’s syndrome a few years ago, has found support through the Milwaukee Area Time Exchange. A member since 2011, Siddiqu has banked time credits by helping people move and garden, building shelves at People’s Books Cooperative, gardening at Weber’s Greenhouses, counting ballots at the American Civil Liberties Union of Wisconsin and assisting at Time Exchange potluck dinners. In turn, he has redeemed time credits for transportation to an Autism support group and Time Exchange activities, and for attendance at the cinema. “Timebanking is the sharing of skills and knowledge rewarded by a community currency based on time,” said Debbie Davis, Time Exchange executive director. Participants earn time credits based on hours worked, and can redeem these for other services. “Everyone’s time is valued equally,” Davis said. Through exchanges, Siddiqu has met other people with disabilities and has been able to discuss living with a disability with people in similar situations, he said. Siddiqu is unemployed and believes the Time Exchange will help him to find work. “Each member has connections to different professions. Hopefully one of those connections will be to professions that I’m interested in,” he said. Siddiqu, who describes himself as shy and reserved, has met people with expertise in history, visual arts, law and nature through the Time Exchange. Like Siddiqu, Susan and John Olson, Time Exchange Inclusion Team members, have found support through the organization. Susan Olson has cared for her older brother, John, who has Down syndrome and dementia, since their mother died in 1985. When she learned about the Time Exchange, she knew it was what they needed. John Olson lost his job at Krispy Kreme Doughnuts in 2006 when the store at which he worked filed for Chapter 13 bankruptcy. Despite active job searching and services from the Wisconsin Department of Workforce Development and other local agencies, he has failed to find work. As a member of the Time Exchange, Olson has earned credits by doing office work at Best Buddies and the AFL-CIO, as well as participating in the Inclusion Team and assisting at Time Exchange potlucks. He also has offered to teach rug-hooking lessons. “It’s always good for people to see that a person with a disability can contribute and be part of the production process for a business,” Susan Olson said. Another chronic issue for people with disabilities, according to Olson, is that their only contact is with paid caregivers, and they have little choice in who helps them. “How meaningful can your life be when it’s surrounded by people who are paid to support you?” she asked. When Olson grew tired of cleaning her brother’s bedroom, she couldn’t get his care plan to pay someone for the task. Through the Time Exchange, she found Tina Hulen, a Milwaukee Public Schools early childhood paraprofessional to clean his room monthly. As the mother of an autistic child, “(Hulen) gets it,” Olson said. Not only does Hulen provide a service, but she and Olson also have built trust and exchanged disability-related information. Hulen earned Time Exchange credits by providing respite so that Olson could attend an overnight conference. The relevance of timebanking to people with disabilities extends to the elderly and other populations reliant on social services. “There are people who won’t ask for help unless they feel they’ve earned it, especially the elderly.… Just a little help can help elders stay in their home,” Davis said. With the de-institutionalization of nursing home care and redesign of public services to be more community based, Olson added, complements to the social service system for people with illness, disability, the elderly and those in the criminal justice system will become increasingly important. Like people with disabilities, people living in distressed neighborhoods often face similar experiences of scarcity. Community connections, resources, safety, self-esteem and feelings of empowerment may be in short supply. As a Safe & Sound community partner organizer in Metcalfe Park, Erin Dorbin said she met many individuals with talents and skills, but realized they were isolated from their neighbors. “It clicked that timebanking would work…to rebuild trust and investment in the neighborhood,” she explained. Now inclusion coordinator with the Time Exchange, Dorbin is working to bring timebanking to people with disabilities and underserved neighborhoods. Davis and Dorbin shared that message at a potluck dinner co-hosted by the Milwaukee Area Time Exchange, 205 W. Highland Ave., and the Metcalfe Park Community Action Team (MPCAT), which is becoming a Time Exchange member organization. The gathering, which took place at the Dr. Wesley Scott Senior Living Community, 2800 W. Wright St., included residents as well as Metcalfe Park neighbors and Time Exchange members with disabilities. MPCAT is a resident group working with the Building Neighborhood Capacity Program (BNCP), a White House project to support and strengthen neighborhoods. Next Door Foundation, 2545 N. 29th St., is the lead agency for the Metcalfe Park BNCP. 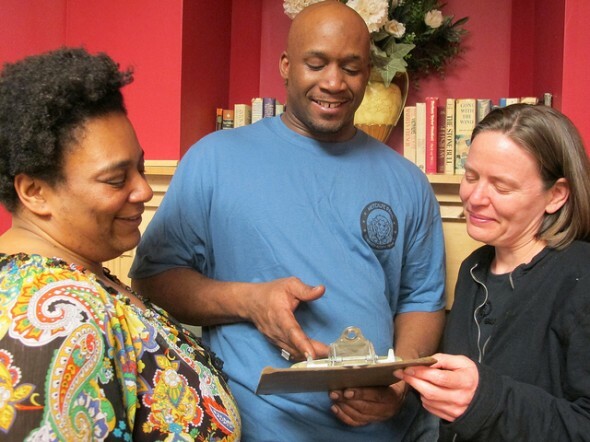 “We can foresee including timebanking in our neighborhood strategic plan,” said Duril White, MPCAT co-captain and executive chef at New Manna Café & Catering. Timebanking coincides with MPCAT’s value of intentional engagement, or purposeful relationship building, he said. By using timebanking as a community currency, the Time Exchange provides the infrastructure for MPCAT to “develop a neighborhood-based economy that supports all the gifts and talents in (the) neighborhood,” Davis said. As a member organization, MPCAT will also be able to compensate residents with time credits for service to the neighborhood association, she added. “The timebank is a subset of what MPCAT does,” explained Ted Matkom, Wisconsin Market President for Gorman & Company, a residential and commercial development firm with units in Metcalfe Park. “We want to bridge our tenants—whether living in apartments at the Scott Senior Living Community or in (other) housing—to MPCAT to bring the community back to what it was. We have got to come together as a community so that we don’t live in silos. We’re an intrinsic web,” he said at the potluck dinner. 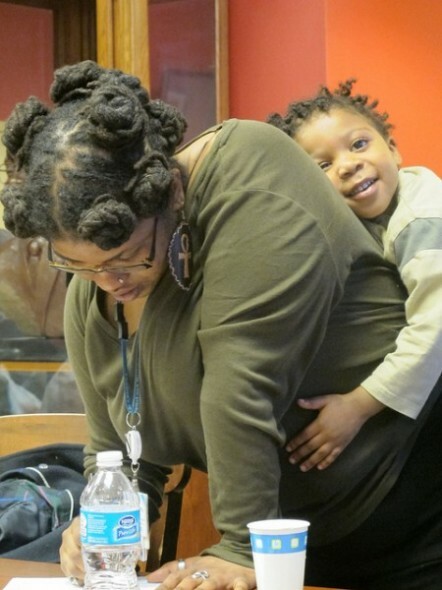 Bregetta Wilson, Children’s Hospital community health navigator for Metcalfe Park, attended the potluck and filled out a member application for the Time Exchange. She requested childcare, yoga, meditation, automobile care and foreign language lessons, and said she could offer transportation, advocacy, counseling and tutoring services, among other services. Although she is an East Side resident, Wilson works in Metcalfe Park and knows it well. The Time Exchange started the year with 40 members with disabilities and plans to double that in 2013, Davis said, as well as expand its reach in distressed neighborhoods. A second office space will open this month in the Washington Park Library, and The Exchange Gallery, a public art installation through IN:SITE’s “Art on Fond du Lac” initiative, will bring the Time Exchange to a vacant building in Sherman Park early this summer. The organization currently has a presence in 53 ZIP codes, with membership concentrated in low-income neighborhoods. Twenty organizations—primarily nonprofits—and 750 individuals are members.